« « Navigate Toward The Past: I’m skeptical, what’s your opinion? Yep, $55.53 – that’s how much it cost me tonight to fill my minivan! I’ve been doing the ‘ol $20 a stop so that I wouldn’t feel the full sting of the pump, but I really was on fumes so I decided, ah what the heck, let me fill ‘er up. Yikes. All I can say is that I’m SO happy that we got rid of our SUV in favor of the Honda Civic Hybrid! The fillup on that truck would have easily been $90. Funny, that looks cheap to me! 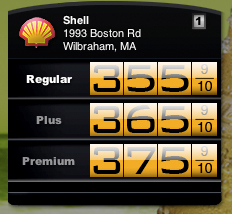 Last week I was in Wethersfield (where the gas is always $.20 cheaper than Tolland) and I was thrilled to get the cheapest gas for $3.69!